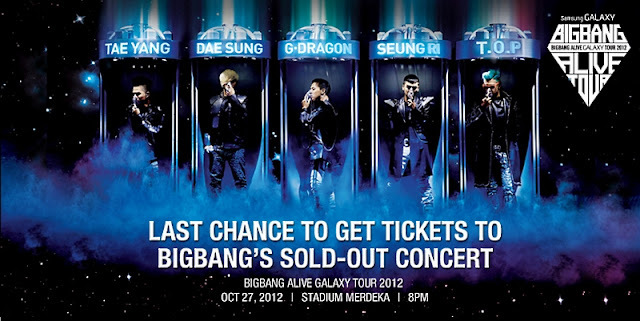 Clever Bulletin: Win Tickets To BIGBANG’s Sold-Out Concert Via Samsung Malaysia! 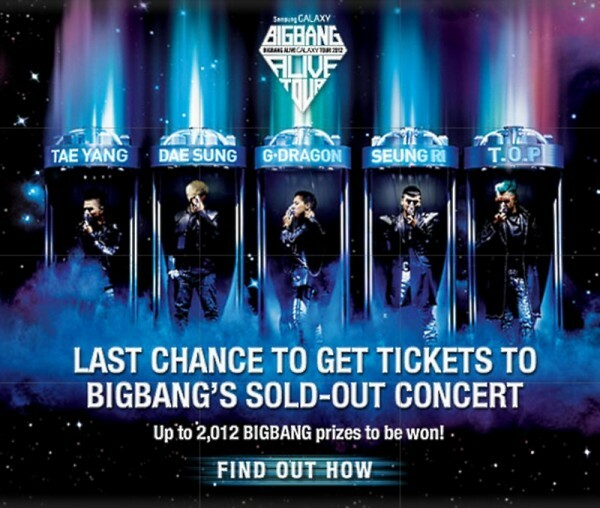 Win Tickets To BIGBANG’s Sold-Out Concert Via Samsung Malaysia! Didn’t manage to buy tickets to BIGBANG’s Alive GALAXY Tour 2012 in Malaysia? At the same time, thinking of buying a Samsung GALAXY S III? Then we’ve got news that could quite possible make your day! From 19th September 2012 to 19th October 2012, Samsung Malaysia is giving you the opportunity to win exclusive VIP concert tickets to BIGBANG’s concert in Malaysia, Limited Edition BIGBANG GALAXY S III Back Covers, BIGBANG Exclusive Box Sets (BIGBANG CD Album, Limited Edition BIGBANG GALAXY S III Back Cover, BIGBANG T-Shirt), and a whole lot more. Thousands more, to be precise. We say, if you’re going to buy a brand new Samsung GALAXY S III anyway then why not, right? Plus, these BIGBANG premiums will not be available anywhere else. True story. Go get ‘em, VIPs. And good luck! BIGBANG Alive Galaxy Tour 2012 Malaysia is set to be the concert of the year with a massive RM 4 million production show, in a one-night only concert at Stadium Merdeka on 27 Oct 2012. 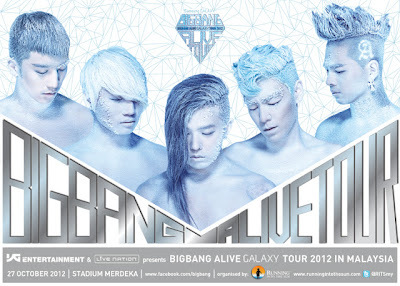 BIGBANG, consisting of five K-pop heroes G-Dragon, Taeyang, TOP, Seungri and Daesung, will perform the Malaysia leg of the BIGBANG Alive Galaxy Tour 2012 on 27 Oct 2012 at Stadium Merdeka for the very first concert in Malaysia. The revolutionary K-pop group is known for their unique urban-originated music and fashion style, often credited to have shaped the hip-hop, R&B and electronic music scene across Asia and now strongly influencing the world. BIGBANG Alive Galaxy Tour 2012 involves the powerful influence of internationally-renowned creative director Laurieann Gibson, who has worked with a stellar list of artistes including Lady Gaga, Beyonce, Janet Jackson and Katy Perry. BIGBANG Alive Tour 2012 will also include a leading production team; including stage and lighting designer Leroy Bennett (Madonna, Paul McCartney, Eagles) and sound engineer Ken Van Druten (Eminem, Jay-Z, Linkin Park). 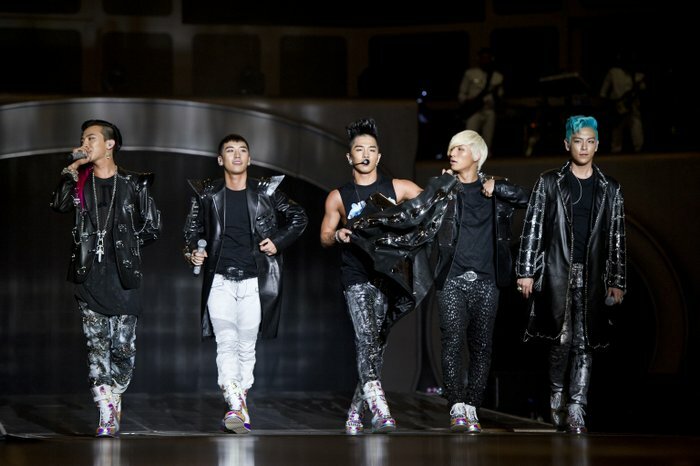 BIGBANG is the first Asian band to receive the “Worldwide Act” Award at the 2011 MTV Europe Music Awards with over 58 million votes, and currently holds the record for the most number of music show awards won with 56 group awards for BIGBANG and a total of 93 individual awards amongst the members. BIGBANG Alive Tour 2012 Malaysia is presented by YG Entertainment and Live Nation Entertainment, Sponsored by Samsung and organized by Running Into The Sun. Share this news with all Big Bang Fans out there now.